Obama will personally tweet from the @POTUS Twitter account. 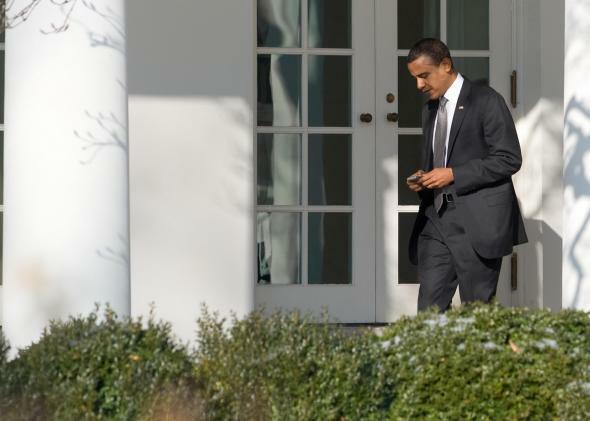 President Obama uses a smartphone in 2009, long before @POTUS. The official (verified!) Barack Obama Twitter account has more than 59 million followers. The handle is run by Obama’s aides, so tweets personally written by the president are signed “-bo.” It seems like a reasonable arrangement for someone who’s, well, pretty busy. But Obama apparently wanted an account all for himself, and with @POTUS, which sent its first tweet this morning, he just got one. It’s not clear yet whether Obama has snapped up @POTUS for himself, or whether it will be handed down like the official Pope account, @Pontifex. Since the account is new, there was a brief period where the Twitter-famous could honestly boast that they had more followers than the leader of the free world. But the account is rapidly gaining followers. Duh. It seems that it wasn’t until the home stretch of Obama’s presidency that anyone (perhaps himself included) trusted him with a personal account. I think I speak for everyone when I say: What could possibly go wrong? Update, May 18, 2015, 1:45 p.m.: It seems that Obama sent his first @POTUS tweet from an iPhone, which is weird because he’s always been very vocally frustrated about having to use Blackberries as part of the White House’s cybersecurity approach.